But then she started chanting, and such prosaic thoughts were driven from our minds. 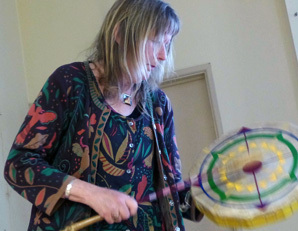 She was summoning her native American Indian ancestors, and it was beautiful. In 1956 the Canadian government declared the Sinixt First Nation Indian Tribe extinct, mainly because they wanted to develop the Indian homelands by mining for valuable minerals, oil or gas, logging in the forests, and building a road through this pristine part of British Columbia in Canada. Removal of ancestral remains from an ancient settlement in the beautiful Slocan Valley, and placing them in a museum, was the last straw. The Sinixts needed to take action. 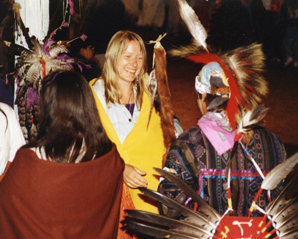 Blond and pale-skinned, English Celia wasn’t born an American Indian, but she became an honorary member of the Sinixt tribe after spending six years helping them prove they were still very much in existence. That evening, the steady beating thud of a drum lured Celia and her kids out of their camper van to the pow-wow. Uncertain of her welcome, she approached, to be met by Red Cloud, who enveloped her in a wonderful hug and spoke to her at length, but not in any tongue she’d ever heard before. No matter, she understood him perfectly. That night, Red Cloud died in his tepee after a massive stroke. Previous strokes had deprived him of his ability to speak English, but Celia treasured their conversation. She was shocked by his death, however, and life suddenly seemed to cave in on her. 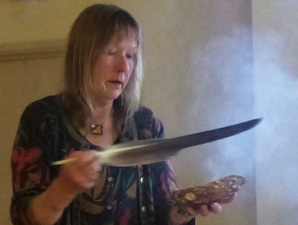 Throughout the ensuing six years, Celia discovered a great deal about the Indian philosophy for living, their Shamanic traditions, the connection between nature and self, and its relevance for all peoples today. She learned quickly, and discovered her personal Totem animal (or spirit guide) when a coyote visited her back garden. You can learn all you need to know from nature, if you know how to look, how to listen, how to pay attention. We all yearn to be connected, we long to belong. Yet we don’t put down roots; if we stay in a place long enough, the earth will grow up around us. So then we do belong. Elders were always placed at the centre of the community, their wisdom and opinions sought and respected. Celia learnt patience - I’ll be shown when I need to know. Nothing happens by accident. Everything has its purpose. Accepting that, going with the flow, brings complete and utter inner peace. American Indians are unafraid of death. They know and understand healing, which simply means restoring balance to the body. But sometimes, healing cannot bring back balance, the only way to achieve balance is to step over to the other side. They buried their dead facing east, always facing the river. Their heritage teaches us to expect the Great Warm. Then the Great Cold. Then we go to the gathering places. That sounds like a pretty fair description of global warming, which will lead to colder nuclear winters. Ending ultimately in our extinction too. And all that happens, is meant to happen, and happens for a reason. It is meant to be. Fortunately for us, last Thursday, that did not include the sage leaves setting fire to Slimbridge Village Hall.